Worship Media UK is the Number 1 distributor of EasyWorship in the UK offering the best service and price in the UK and Europe. Once purchased we will contact you for all the information to get your purchase registered. We will also send you a copy of the software on disk and all of your paperwork and EasyWorship is covered by a 90 day money back guarantee. 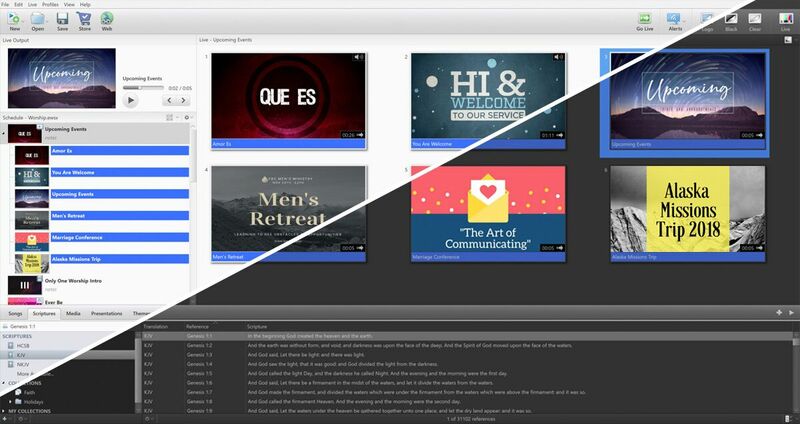 EasyWorship is a powerful, yet simple church presentation software. Build your entire service – song lyrics, Scriptures, announcements, videos and sermon notes – in one place, quickly and efficiently. Experience the software that is uniquely designed to meet the needs of churches, big and small, around the world. Integrated Media Store - Why go to multiple places to get what you need? With EasyWorship's integrated media store, you can download the media you need right into your software. Simply click on the Web button and choose top media pieces from Skit Guys, Centerline New Media, Hyper Pixels Media and more! Presentation Designer and Theme Designer - Between EasyWorship's Presentation Designer and powerful Theme Designer, you can let your creativity soar! Use the Presentation Designer to design with transparency, reflections, text outline and bullets. With Theme Designer, you can design a consistent look and feel for each section of your service. Search Function - Whatever you need to search for, EasyWorship's search function makes your libraries of scripture, media, and songs much more manageable. 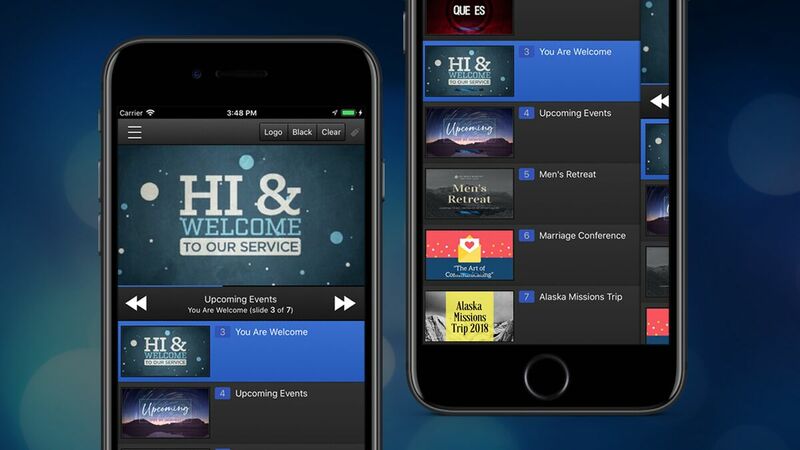 You'll be able to find last minute scripture and add it to the service schedule in a pinch. Or you can organize your media by collections and never have to wonder where your media is. Broadcast Support - EasyWorship supports Alpha Channel, NewTek Tricaster AirSend and Blackmagic, along with NewTek NDI (new to EasyWorship 7!). Whether you're wanting a more traditional production set-up or you're wanting to venture into the world of a wireless production team, EasyWorship can fit into your weekly workflow. Message Alerts - Use Nursery Alerts to grab a parent’s attention without disturbing the service. Or use Message Alerts to let the prayer team know when it’s time to pray for people. Alerts are a great way to communicate to your congregation while keeping the service running smoothly. When you need to communicate to the people on stage, alerts can also be transmitted to the Stage Display as well. DarkInterface–WithEasyWorship7,customersnowhavetheoptionofadarker interface. Keep the focus on worship, and not the monitors. Remote App - With our EasyWorship Remote App for iOS, control your schedule from the stage or use your iPad as a Foldback screen. That's right! Just download the Remote App from the iOS App Store and enjoy the flexibility and control you've been waiting for. Undo Function - Can't imagine life without the Undo button? Neither can we. That's why we have added to it almost every window within EasyWorship 7. Now you can work with confidence, and even be a little creative, knowing that your last design is just a click away. Color Your Songs - Keep everyone on the same page! Your volunteers will feel confident with color-coordinated worship slides for each song. No more wondering where the chorus ends and the verse begins. Let EasyWorship 7 keep you even more organized. Alpha Channel Video - Introducing Alpha Channel Video! Your one-stop shop for all your layering needs. Now, you can layer text over a lower-thirds motion in a live feed, or any other combination you need! And you can do all of this without large Pro Res files. Have confidence with the Foldback Screen feature. Never miss another transition with the Black, Logo and Clear buttons. Personal support is here to help you through the tough questions and it’s all yoursvia subscription purchase! Our pricing options are sure to fit your budget. With even more options for licensing, you’ll get exactly what you need to make yourservice a success Check them out today!